Should You Choose a Revocable Living Trust? In former times, a popular scam would involve a letter informing you that a long-lost relative had died and named you in his will as the person who would inherit his considerable wealth. Of course, the scam didn’t work very well on the general public. 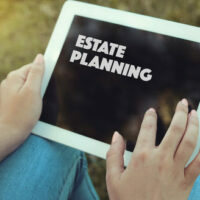 Even if the details provided about the sender did seem plausible, anyone who has dealt with estate planning knows that it is almost never fast, easy, or cheap to get the money that a deceased relative has bequeathed to you. Living trusts are an increasingly popular alternative to traditional wills, but there really is no perfect solution to the fact that the inheritance process is not as simple as it looks. Why Is Inheritance Such a Complicated Legal Matter? The main reason is that the person who actually owned the money is no longer around to speak for themselves. Without so many legal regulations, the situation to quickly devolve into family members arguing all sorts of unverifiable claims in court about promises that the deceased relative alleged made to them when he or she was alive. The solution is to treat the deceased person’s property as a legal entity, as though it were a business. Like a business, a will or trust cannot speak for itself, but it has documents and named legal representatives to speak on its behalf. Therefore, a will or trust must file a tax return, like businesses do, because it has income (interest on assets) and expenses (legal fees, paying the deceased person’s debts). A will or trust requires its own tax ID number, just like a business does. A trust is a legal entity in which you (the grantor) choose someone (the trustee) to distribute your assets to the person you have chosen to receive them (the beneficiaries.) There are two main reasons that people choose revocable trusts. The first is to make it easier for their heirs to access the money after the grantor (the person who set up the trust) dies. If you just leave a will, your estate has to go through the probate process in court. The other advantage is that the “revocable” part means that you, as the grantor of the trust, can easily amend your decisions about how you want to divide your assets whenever you choose to. Some people choose living trusts in the hopes of avoiding paying estate taxes, but taxation is inevitable. If you want to leave your money to someone, either you or the beneficiary will have to pay considerable taxes on it. Attempts to avoid paying taxes on inheritance almost always backfire in one way or another. It is never too early to start planning your estate. Contact Bundza & Rodriguez in Daytona Beach, Florida for sound legal advice about your estate. We do not charge a fee for meeting with you to evaluate the merits of your case. We will even come to your home or hospital room at your request and convenience. Please contact us at (386) 252-5170. Our schedule is flexible to meet your needs. © 2017 - 2019 Bundza & Rodriguez, P.A. All rights reserved.